The most beautiful courses in the world often look like mother nature did all the work, although dozens of machines and grounds keepers might disagree. 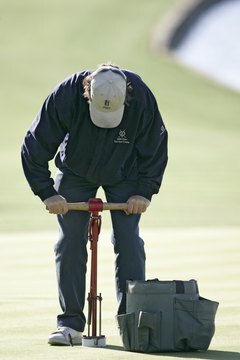 The operation of a golf course requires having the proper equipment. Equipment that is used on a golf course is often manufactured for specific use on a golf course. The equipment is used to keep the course in pristine condition and to ensure that good turf management practices are in place and maintained. The grass-cutting equipment used on a golf course is specialized for maintaining the turf. Fairway mowers use reels similar to those found on antique mowers. The reels found on fairway mowers, however, are technologically advanced with such features are variable reel speed, which allows the grounds maintenance crew to adjust the cutting speed of the reels to the mowing conditions (thicker grass in spring and summer will need a faster cutting speed that thinner grass in fall and winter). Greens mowers, which come in walk-behind and ride-on models, are highly specialized and technical machines. Greens mowers also utilize mower reels, controlled by a complicated hydraulic system, which are capable of cutting the grass to the low levels needed on a golf green. Aeration on a golf course is a cultivation process whereby the turf is actually penetrated with a tine and a "plug" is extracted. This process removes organic material from negatively affecting the roots of the turf. Aeration is most often performed on tees and greens but is also performed on fairways. Aerators and topdressing equipment are the machines used to perform this important turf-management task. A golf course that does not possess this equipment will notice a substantial lack of turf quality that will be noticeable to discerning golfers. Most golf courses use chemical fertilizers and pesticides to promote steady growth of the turf and to protect the turf from destructive insects and pests. Spraying equipment is dedicated solely to the spraying process and consists of a vehicle, a drum for holding liquid and spraying arms. Most golf courses have sand bunkers that, unless they are maintained, can become unruly and unattractive. Grounds crews use mechanized bunker raking equipment to properly and efficiently rake the sand bunkers to keep them in good playing condition. Before the advent of these machines, these crews used hand rakes in a painstakingly slow process to rake and maintain the sand bunkers. These machines use special tires designed for ease of traction in sand to help them maintain a course's sand bunker program.